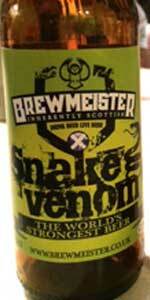 Snake Venom is the world’s strongest beer as of 24 October 2013, coming in at 67.5%. It is dark amber in colour with no carbonation due to the high ABV. Unlike the previous Armageddon, the alcohol is not masked in Snake Venom. It is highly present yet it still tastes like a beer with a good degree of hop profile. Each batch is tested by the brewery before bottling and random batches are tested externally. It pours looking like a good whiskey. Thin, and with a nice amber color. No carbonation, no head, looks just like a shot of whiskey. The aromas are overtaken by those of hard alcohol. Ethanol swallows up everything else that can be found on the nose for this beer. You do get a slight peatiness that does cut through the alcohol slightly. You get more positive characteristics as it warms. The burn is real here. Very strong, no escaping it. However, it tastes much better than it smells. With familiar peaty, boozy notes that you can find in many whiskeys, it does in fact have some redeeming qualities. However, while it does have more character, I’m still really only getting strong peat and alcohol. Slight oak, and if you want to stretch it, maybe some dried fruit. While the burn is intense, it does finish warm and smooth. Going into this, expect tasting an incredibly powerful whiskey rather than the world's strongest fortified beer. Cheers, I may or may not remember this tomorrow. A few of us pitched in to purchase a bottle of this beer. First there is a warning label on the bottle that warns to not to exceed 35ml in one sitting. Not even sure where to start with reviewing this beer, except to say it smells, tastes, and feels like hard alcohol. Very ethanol and peat after-taste as well but that's expected of a beer this strong. Thanks to Luwezzy for opening this one. Was too sceptical to buy a bottle myself due to the open ended questions left on Armegedden... That being said this beer does I fact light on fire so the abv should be pretty high. The beer pours as a caramel brown color with a very thin fast fading white head. The beer hangs on the glass like whiskey. The smell of the beer is sweet and boozy, there is a subtle citrus note. The taste of the beer is a lot like a mild whiskey of some kind with a sharp hop bitterness in the finish. The mouthfeel has a good amount of heat, far more than Armageddon. The beer finishes warm and smooth. Overall this beer is slightly more impressive than Armageddon. I think I liked it better overall but it's not the best Barleywine out there.